Hanging punctuation has long been one of the hallmarks of expert typography. Adobe® InDesign® CS has provided for this with its Optical Margin Alignment. This feature makes it a snap to achieve an optically aligned margin – an effect you previously had to create manually, and painstakingly, with desktop publishing software. Quark 8 has finally stepped up to the plate, and now contains a very robust feature with precise and customizable controls for hanging characters. Quark 8 allows you to quickly control the look of your text margin alignment with two options. You can apply preloaded settings for Hanging Punctuation, to hang the full width of the character, or Punctuation Margin Alignment, to hang characters partially. Three justified settings: The upper sentence has no hanging characters, so the margins don’t look aligned. The middle one uses Quark’s preloaded Punctuation Margin Alignment to hang characters partially. The bottom one uses Hanging Punctuation to hang the full width of the character. The Hanging Character features in Quark also enable you to customize settings to fit the exact needs of a particular design, typeface, or even a specific character. You can control and apply settings to single or multiple paragraphs, so they don’t have to affect an entire story. You can even include Hanging Character Sets settings as part of a style sheet. When customizing these settings, note that Quark uses rather unconventional terminology when describing hanging characters. Leading refers to the beginning of a line of text (usually the left margin), and trailing refers to the end of a line of text (usually the right margin). There are also classes and sets: a hanging character class is a group of characters that should always hang outside the margin or indent inside the margin by the same percentage. A hanging character set is a group of hanging character classes. The good news is that you can customize hanging character settings down to specific combinations, at virtually any level of hanging. The less good news is that the process is rather complicated and tedious – not for the faint of heart! • Go to Style > Formats. • Open the Paragraph Attributes > Formats. 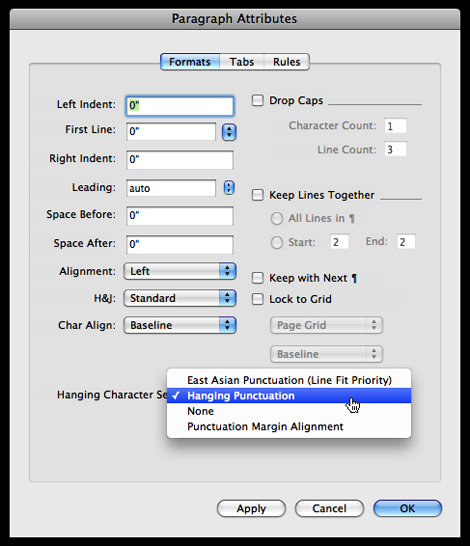 • From the Hanging Character Set drop-down menu, select Hanging Punctuation or Punctuation Margin Alignment. 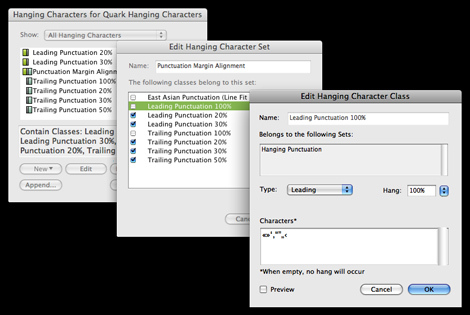 Quark’s Paragraph Attributes dialog box is where you can select a Hanging Character Set. • Edit > Hanging Characters, then edit as desired. The path to customizing Hanging Character settings is not for the faint of heart! To go deeper into customizing Quark 8’s Hanging Characters capabilities, check out their Hanging Punctuation screencasts at http://8.quark.com/learn_more.html.